He's gorgeous. I mean, he is so so so gorgeous. Luke is my newest roommate. He is number seventy. I thought I was done having roommates but then I lost my job so it was back to placing my ad on Craigslist. I had gone down from two mattresses in my living room to one and was so excited to finally go to none after eight years. Now, I am back up to two. But, how lucky am I that Craigslist exists and that I find cool people to help me pay my mortgage? Also, Luke and my other current roommate are great so there is a really fun vibe in my apartment; that makes it a lot less painful. Luke responded to my ad and said he needed a place for August starting immediately. I was pretty desperate to fill the spot and since it was only for a month, I quickly looked at his Facebook, saw that he looked cool and told him to call me. We chatted briefly and he seemed like he had good energy so I was like, "Sure, you can move in tonight." After eight years, as I told Ms. American University, I know what I am doing. I have a 100% accuracy rate so far on reading my roommates. This is not to say that I have a 100% success rate with them. But, it was only because I didn't listen to my gut which gave me two bad experiences. Roommate Number 17? Ooof. But... you have to read my book for that story. Side note: ALWAYS listen to your gut. Now that Luke lives with me I spend a lot of time staring at him. And he spends a lot of time staring at himself. And it is really funny and we laugh about it. He wants to be a model which, given his face, is totally realistic. The other night he was alternating between doing push up and practicing poses in the living room mirror. I was like, "Luke, you are soooo gorgeous." And he was like, "I know!" But the thing is, he isn't arrogant or conceited about it. It is just a fact. And he is aware of that fact and he owns it. I like that. Humility is good and all, but self awareness and confidence are more fun. And, since I am very aesthetically sensitive and also have kind of a tourettes for compliments, it is really nice that I can basically tell him I love his face non-stop and he just agrees rather than feels weird about it. 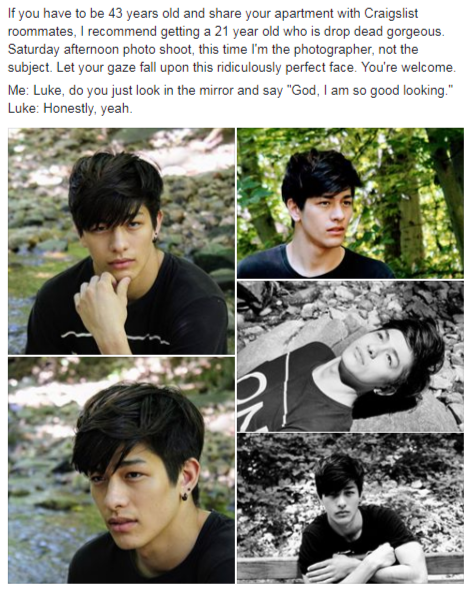 But, this post isn't really even about Luke or his gorgeous face. It is about a Facebook post lovefest. And lovefests are my favorite. So, the other day Luke and I did a photo shoot so he can start building a portfolio and I posted my favorites on Facebook. We thought a bunch of his friends and my friends would like it and that would be it. But something way better than likes happened. I've taken pictures of Luke since he was less than one hour old so it's very interesting to see him through someone else's creative eye and lens. [Do] these expressions that I am less familiar with show new sides of this evolving young man that I am proud to call my son or are they perhaps testament to his success in cultivating some skill in acting as he contemplates a side career in modeling? ...while the Luke that I know and love is conscious of his physical attributes, he also has ambitious dreams of sharing his huge heart, working very hard, and applying his imagination and numerous passions to create a wonderful life for himself and many many other people. How lovely of his dad to post such a heartfelt comment on my post, right? With such an expressive and supportive Dad, your son without a doubt will further along your support and encouragement in his own dealings and I wish him continued steps forward, aiming high AND many successes on any opportunities that he chooses. And applause to you Dad - too few men are willing to share their heartfelt emotions. Dad, you have succeeded being a VERY WONDERFUL DAD. Dear [Luke's Dad], thank you, but you should have had at least 20 sons. The world would be a better place. Thank you very much for your words of support dad!!! It feels very nice to feel appreciated for trying to express myself in a way that is new, exciting, and unfamiliar. Luke's dad jumped back in. Remember, this is on FACEBOOK. I am humbled by expressions of appreciations just for being a dad. I certainly accept that openly expressing feelings does not come easily for many men, but we all try our best in our own way. I highly recommend that men get to together with other men to talk about life in real ways to support this process. I've been in 3 stable groups in my life - the most recent one has been going for 15 years - it has provided a unique and safe forum to share ups and downs of relationships with our wives, children, parents, ourselves and others. The biggest factor to being a good dad for me is to having a loving, supportive wife since sharing this journey called parenthood is one of life's deepest challenges. In the beginning one has to focus intently on providing everything for a helpless being, then learn the fine art of building that young person's confidence to take on more and more challenges of the world on their own. At first you are always there as a safety net and then gradually have to even withdraw that knowing that sometimes they are going to have to hit the ground themselves to learn their own tolerance for risk and reward. One hopes they will always get up and try again. As long as I see Luke's genuine smile, I will know that his spirit is strong. What a great example of a father and a man, right? I think my writers like me because I am real. Well, here is a real dose of real and I just love it. Thanks for sharing our Facebook posts with your blog audience. Due to character limits on comments, I'll divide this one in two and try to be more concise in the future. It’s a bit odd but also an honor to be able to share a few things about my experience as a father to a wonderful young man and a few thoughts about my somewhat alternative journey as a man. I spent the morning at Quaker meeting, and worked on overdue accounting most of the afternoon so I gave myself permission to write this response this evening with the hope it will be a welcome addition to your blog. My wife Yuri and I never expected that a 20-minute check-in with our son Luke over Skype last Monday would end with a fleeting introduction to you as his newest roommate (??) before you both darted off to meet two of your friends for drinks. I’ll admit that we were a bit perplexed – what crazy housing situation has our son gotten into? Luke said you had written a book and regularly wrote a blog so we decided to follow his invitation, do our due diligence, and try to satisfy our curiosity by reading your Facebook posts and blog. We have a daughter who is five years older than Luke who is very pretty, but we all learned to take these aspects of her being in stride and just focused on her intellectual, emotional and spiritual development as she grew up. So it seemed unexpected in some ways that Luke is perhaps getting even more attention and to some extent cultivating his good looks and image as a more intentional part of his persona. These events have provoked me to ponder the conflicting values, judgments and behaviors that I and most of our society wrestle with concerning the way that people look. I want to feel OK about looking at women who seem attractive to me but not do so in a way that feels disrespectful to my wife or the women involved. On the other hand, I have felt paternalistic and jealous emotions rise when I have seen other men checking out my daughter and wife. It’s a new and unprocessed experience observing women make comments about my son. I know the fantasies that often lurk behind men looking at women; I don’t really know what shape these take in the other direction. I suppose, though, it’s really not my business. Luke is a young man who I believe will handle this attention in the proper way. I just lament times when people let their good looks get to their head and sometimes use this asset to coax or perhaps even allow others to give them some part of themselves in exchange for attention if their feelings for the other person aren’t genuinely reciprocal. If both parties’ eyes are wide open, so be it, but I made many mistakes involving undiscussed expectations when I was younger that caused more confusion and pain than I care to elaborate. In any case, Jen, I appreciate the sincerity with which you write because it seems you are trying to share real life experiences that many people, particularly those seeking a lasting romantic relationship, can relate to and hopefully learn from. I think it’s cool and wise that you take the time to carefully screen your potential roommates through Facebook, follow-up the candidates with face-to-face interview and ultimately trust your gut to make the final call. Even if you need the rent to help pay your mortgage, your home is your home and you have every right to make sure that you feel completely comfortable with the people you invite to share this private space with. I am delighted that Luke passed this test since I imagine he is a fun and considerate apartment mate and it seems like you are giving him support and opening doors to new adventures and opportunities. Your blog has provoked many other thoughts, but I have gone on too long now so I will not venture more thoughts unless invited. Suffice it to say for now that I respect that you have built a considerable following in a short amount of time. I have kept an intermittent blog about my work and adventures in the Amazon rainforest for the past ten years, and I don’t think I have attracted more than a few dozen followers and never more than two comments on any post. Best wishes to Luke’s new friend in DC. P.S. Thanks much for your personal response to the first draft of this on Messenger. Wonderful to hear that Luke and your other housemate are blending well with each other and you. I’ll leave it to you to respond to this comment in the more public sphere as you see fit.